The needle-leaves of junipers are hard and sharp, making the juvenile foliage very prickly to handle. 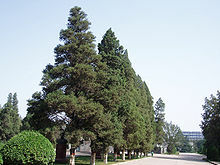 This can be a valuable identification feature in seedlings, as the otherwise very similar juvenile foliage of cypresses ( Cupressus, Chamaecyparis) and other related genera is soft and not prickly. ^ Hampe, Hampe; Petit, Re´my J. (2010). "Cryptic forest refugia on the 'Roof of the World'". New Phytologist. 185 (1): 5–7. doi: 10.1111/j.1469-8137.2009.03112.x. PMID 20088971. ^ a b Rawat, Yashwant S.; Everson, Colin S. (2012-10-01). 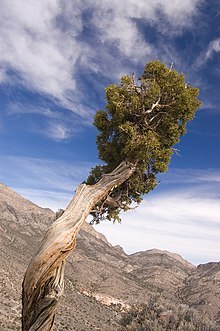 "Ecological status and uses of juniper species in the cold desert environment of the Lahaul valley, North-western Himalaya, India". Journal of Mountain Science. 9 (5): 676–686. doi: 10.1007/s11629-012-2274-0. ISSN 1672-6316. ^ Belsky, A. Joy (1996). "Viewpoint: Western Juniper Expansion: Is It a Threat to Arid Northwestern Ecosystems?". Journal of Range Management. 49 (1): 53–59. doi: 10.2307/4002725. JSTOR 4002725. ^ Miller, Richard F.; Svejcar, Tony J.; Rose, Jeffrey A. (2000). 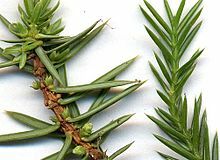 "Impacts of Western Juniper on Plant Community Composition and Structure". Journal of Range Management. 53 (6): 574–585. doi: 10.2307/4003150. JSTOR 4003150. ^ Bombaci, Sara; Pejchar, Liba (2016). "Consequences of pinyon and juniper woodland reduction for wildlife in North America". Forest Ecology and Management. 365: 34–50. doi: 10.1016/j.foreco.2016.01.018. ^ Gallo, Travis; Stinson, Lani T.; Pejchar, Liba (2016). "Pinyon-juniper removal has long-term effects on mammals". Forest Ecology and Management. 377: 93–100. doi: 10.1016/j.foreco.2016.06.029. ^ McCabe, Melvina; Gohdes, Dorothy; Morgan, Frank; Eakin, Joanne; Sanders, Margaret; Schmitt, Cheryl (2005). "Herbal therapies and diabetes among Navajo Indians" (PDF). Diabetes Care. 28 (6): 1534–1535. doi: 10.2337/diacare.28.6.1534-a. ^ Christensen, Nedra K; Sorenson, ANN W; Hendricks, Deloy G; Munger, Ronald (1998). 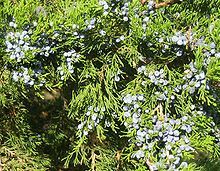 "Juniper Ash as a Source of Calcium in the Navajo Diet". Journal of the American Dietetic Association. 98 (3): 333–4. doi: 10.1016/s0002-8223(98)00077-7. PMID 9508018. ^ Ballew, Carol; White, Linda L.; Strauss, Karen F.; Benson, Lois J.; Mendlein, James M.; Mokdad, Ali H. (1997-10-01). "Intake of Nutrients and Food Sources of Nutrients among the Navajo: Findings from the Navajo Health and Nutrition Survey". The Journal of Nutrition. 127 (10): 2085S–2093S. doi: 10.1093/jn/127.10.2085s. ISSN 0022-3166. PMID 9339174. Mao, K.; Hao, G.; Liu, J.; Adams, R. P.; Milne (2010). 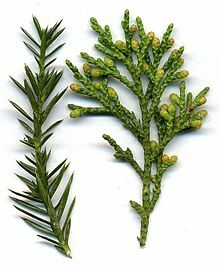 "Diversification and biogeography of Juniperus (Cupressaceae): variable diversification rates and multiple intercontinental dispersals". New Phytologist. 188 (1): 254–272. doi: 10.1111/j.1469-8137.2010.03351.x. PMID 20561210.